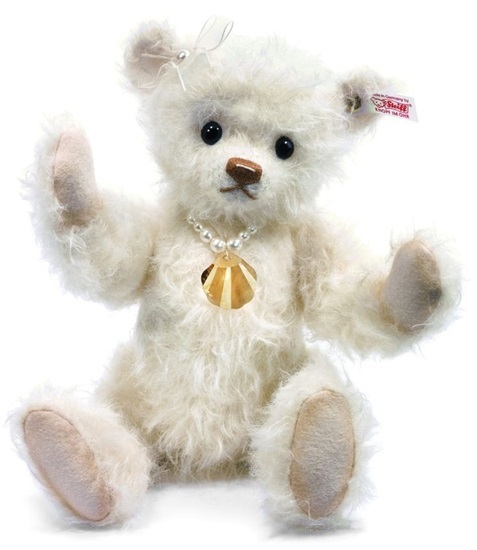 New from Steiff, Shelly is made of white mohair and features a Swarovski shell pendant worn around her neck. Shelly is 11 1/2 inches tall and made of a luxurious, white felted mohair. She is five-way jointed and features attentive black eyes. Her light brown, hand-stitched nose is accentuated with white stitching in the center. Shelly wears a lovely strand of pearls around her neck with a striking Swarovski shell pendant on the end. She also has an organza bow with a pearl in her right ear. Shelly is a 2012 Worldwide limited edition of 1500.